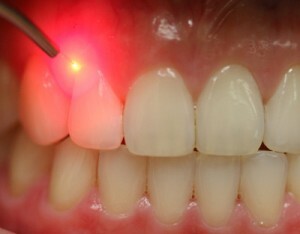 There are multiple types/classifications of lasers used in dentistry. Some cut only soft tissue while others are able to cut hard tissue such as tooth and bone as well. For this article, I will restrict discussion to only the soft tissue laser and leave the pros/cons discussion about hard tissue lasers for another time. I love my 810nm Diode laser because it is such a great dental multi-tool. It functions much like a scalpel in that it cuts tissue during my dental surgeries but unlike a scalpel it cauterizes and sterilizes while cutting. This may sound minor but has major implications for both the dentist and the patient. Since the area is cauterized and sterile, it heals faster and with little, if any, pain to the patient. The cauterization and sterility of these surgical sites additionally creates situations where sutures are not ever needed. This promotes faster healing and added comfort to the patients. For decades, dentists have had "electrosurgery" units at their disposal. These precursors to modern diode lasers are effective but have many pitfalls which are solved by diode lasers. Electrosurgery units use electricity to essentially "burn" away soft tissue. While effective, it is very traumatic to the tissue and can cause significant discomfort. Since they use electricity, these units cannot be used on patients with metal in their bodies due to the conductive properties of many metals. Dental implants, gold crowns, and silver amalgam fillings for example, are made of metal and applying electricity to the situation would not be a good idea. 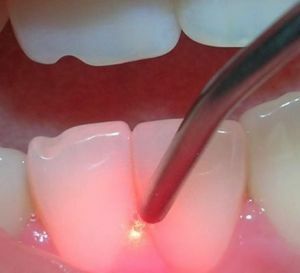 Lasers do not use electricity and are completely safe for use around dental work as well as other internal metallic items such as pacemakers and internal defibrillators (both of which don't care much for electricity). The most commonly observed laser benefit to my patients is certainly my reduced use of retraction cord during crown preparation and impression appointments. While still indicated in certain situations, retraction cord is that "string" the dentist places up into your gums to create a temporary space between the tooth and gums just prior to taking the final crown impression. Space is needed to accurately capture every edge of the prepared tooth to allow the dental laboratory to fabricate an accurate crown. Some patients find the process of "packing cord" uncomfortable both during the appointment and the next day. When indicated, I routinely eliminate the retraction cord and create the necessary space with my diode laser. I feel this is a much less invasive method to create the necessary space and affords the added luxury of cauterization and sterilization of the area as mentioned before. While not everyone finds the process of packing cord uncomfortable, I have many patients that mention how much they prefer the laser method due to its atraumatic precision. 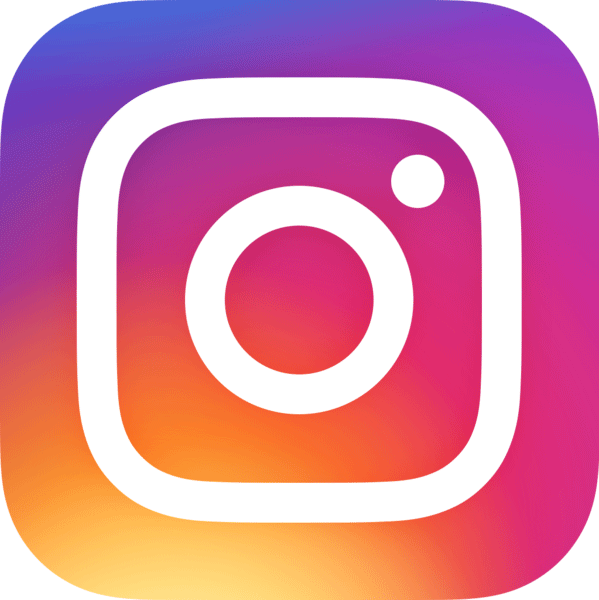 If you would like to speak about Laser Dentistry, or any other dental topic, please feel free to call the office and schedule a complimentary appointment with me. Email and Twitter are also available options. I am extremely passionate about modern dentistry and love discussing it with patients, so don’t hesitate to contact me.